Very late to this one, but will tippity-tap my thoughts down anyway with all my characteristic exclusion of cinematic analysis and worthy point making very much intact. So, let’s look at Tinker! Tailor! Soldier! Spy! : the 3D multi-million dollar musical currently taking the box office by storm. 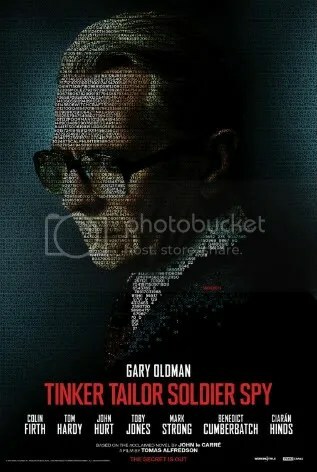 Tinker Tailor Soldier Spy (hereby referred to as TTSS for simplicity’s sake) is one of those films you just know is going to be of a certain calibre. It’s got an impressive cast list, boasting the some of the best thespians Britain has to offer and is based on the well-known and super respectable John Le Carré novel about grimy Cold War dealings, betrayal and intrigue. It’s sort of like The Expendables for readers of The Daily Telegraph. The film is set in the middle of Cold War-era Britain. After a supposed covert mission goes awry, British intelligence head honcho Control (John Hurt) and his right-hand man, George Smiley (Gary Oldman) are sacked. However, when rumblings of a Soviet mole start becoming louder, the higher-ups bring back Smiley to track down the traitor in his old organisation where no-one can be trusted and everyone is a suspect. The plot demands full audience attention. This isn’t one of those films you can nip out for a quick piss and come back having not missed anything important. Whilst it takes a while to get going, the film is tense and compelling for the most part. There are many twists and turns, but it all ultimately settles down to a satisfying conclusion. The cast are the main strength here, mixing seasoned veterans such as Oldman and Hurt with younger, almost household name actors such as Tom Hardy and Benedict Cumberbatch. The cast is superb without exception. Even the secondary players such as Kathy Burke and Roger “Trigger” Lloyd-Pack leave a lasting impression in their limited screen time. Oldman turns in a reserved performance, very rarely raising his voice and always seeming detached from his surroundings. TTSS is initially a tough watch. Whilst everything from the era-accurate details to the aforementioned awesomeness of the acting is dead-on, I found myself not getting in to it for the first 20 minutes or so. The pace is purposefully slow and methodical, but I found myself focusing on the set dressing and cinematography more than I was on who the characters were. Now this could be the attention-reducing effects of all those mindless blockbusters and violent video games finally catching up with me, but I couldn’t really grasp who was doing what and why. One could argue this was the point, but I’m not convinced. Once the film picks up the pace, certain character elements start to fall into place and I got a better sense of the characters. Once this happened, things understandably got more interesting and thankfully this self-styled “Cold War thriller” started to actually thrill. There were a couple of plot highlights for me, but I’d rather not spoil them as the film’s got that whole “web of intrigue” thing goin’ on. I will say I especially enjoyed Tom Hardy’s performance as Ricki Tarr and I thought Mark Strong was fantastic as Jim Prideaux. Cough, cough birdonfire cough. I'm looking forwad to seeing this one, Ben. Such a good cast.